Cet article est aussi disponible en français : 10 raisons de choisir Opera. This is a translation of my own article written in French. I usually translate from English to French, so please bear with me. Opera has been my main browser for several months now, but I keep finding out about new features I can't do without. Some of these features are also available in Firefox and maybe in Internet Explorer, but mainly as extensions. All these features are built right-in in Opera 8. Here they are, in no particular order, ten reasons to choose Opera. Regardless of how the page is built, with or without tables for layout, you can use the zoom feature to zoom in. Zooming does not only let you blow up text, but also the entire page layout. Whether you have low vision or you want to read an article with you feet on the table, far from the screen, or you are facing a badly coded page, you can rely on the zoom. You have certainly, at least once, unintentionally closed a tab. Opera thought about you and brought the concept of the trash bin to the tabs. All tabs closed during a session are sent to the Trash, so you can find back all the URLs you visited. Sesssions enable you to save all open tabs to reopen them later. This can be very useful for web developers for instance, working on several projects: you can save for each project the work environment you need, with the phpMyAdmin page, etc. As I already said, I browse with plug-ins disabled to avoid the annoying animations and Flash ads. You can very easily enable or disable plug-ins in the Quick preferences menu (hit F12). This will also save your eardrums from blowing up when you open a page in the background containing a Flash website that deemed it absoulutely necessary to use an explosion in its intro because it's cool . GIF animations are one of the ills of the Web: they are generally useless and they interfere with your reading. A simple F12 turns them all into just a bad memory. The first frame will still be displayed, so if the image has any purpose, you don't lose anything. You can't imagine how agreeable using forums can be, once they are rid of those unbearable animated GIFs. It is also possible to disable iframe elements from the preferences menu (Tools > Preferences...) in the Advanced tab, then in Content. Google ads, among other things, are displayd in iframes. These ads are obviously useless but they also use some valuable screen space and disturb your reading even more. On the other hand, very few sites offer worthy content in iframes. I discovered this feature by chance and now I can't live without it. In Opera you can re-arrange the tabs as you wish, with a simple drag and drop. Need I say more? Once you get used to this feature, you'll be looking for it everywhere, even on the Windows task bar. On the same subject, a feature that can save you a lot of time, for instance when filling in a badly coded form, is the ability to duplicate any tab and its history. Say you are filling a form and you need to look back some info from the previous page. Can you risk using the Back button and lose everything you've already typed? Just duplicate the current tab and play with it without taking any chances. You can duplicate the current window in IE, but apparently not In Firefox (I know there are extensions, thank you). This is where the opera innovation really kicks in. Mouse gestures can be mapped to actions: the dream of mouse junkie. Here are some examples in pictures. That may not look like much, but this too will soon prove addictive. When you have a URL in the clipboard, you usually intend to paste it in the address bar of your browser and go there... So why not just Paste and go? 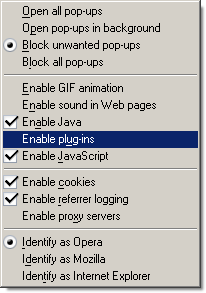 That's what Opera proposes to do when you right click the address bar. All modern browsers offer to log the user names and passwords entered on you favorite websites. But Opera's Wand has an edge over any other system I have seen: More than the very intuitive multiple accounts management (very nice when you have 15 Gmail accounts for instance) and its total transparency, what I really appreciate is the orange outline for any input form where information has already been saved. When you see that outline, just click the Wand icon and you won't even have to click the submit button. All these features are also available in the free version. Let me also say this is not an advertisment for Opera Software (and there will never be any ads on this website). Commentaires on this article are closed.